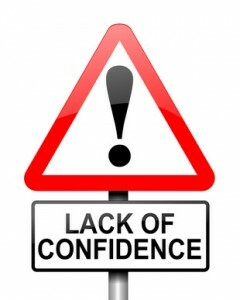 talkhealth > Blog > 2012/11 > Confidence? What confidence? Confidence, self-esteem, self-worth… Whatever you call it, I wish I had more of it. Judging by the number of helpful people who offer insightful advice like “You just need more confidence,” there must be plenty of it out there, growing on trees, bushes and all around, just waiting to be picked. When you feel like you’re invisible and inaudible, like nothing you say is of any consequence and nothing you do matters or is good enough, confidence is very hard to find. In my case, low self-esteem has been one of the most crushing aspects of depression and its lingering aftermath. It’s like the nasty green stuff you still find yourself coughing up three weeks after a cold. It festers in your head and makes you feel lousy – small, insignificant and feeble, yet angry that you should feel that way, or that others might not value you as much as you think they should. Even in areas where you used to feel confident – things you once knew you could do well – you can lose belief completely, and that lack of faith in yourself can prevent you from doing anything. It’s not just your abilities you start to doubt. You can find fault with just about any aspect of your personality and appearance. In particular, my depression has made me feel older and fatter than I am. At times, I’ve looked at myself in the mirror and just felt grey and lifeless. I find myself worrying about the clothes I wear, and whether they suit me. I doubt the decisions I make on just about every aspect of my life. When you’re so self-critical, you assume everyone else thinks the same, so you can become paranoid and anxious. Just going out to meet friends at the pub can seem overwhelming. So what can you do about depression’s mean-spirited assault on your confidence? How can you build it back up? I think the main answer lies in a battle between reality and your perception. The worst thing you can do is to keep telling yourself that you have no confidence. In reality, you do still have the abilities you had before depression came along, and it’s unlikely that you really look much different, so don’t let the voice of depression tell you otherwise. People aren’t always looking at you and judging you. You’re just more self-conscious. Even if someone is judging you, well so what? Is it up to them who you are and what you do? No. Only you get to decide that. I find it helpful to write down positive things that happen to me, and nice things that people say, on a daily basis, and to read these notes regularly to remind myself that actually I’m doing pretty well and it will take more than a bad day to undo the progress I’ve made. Aside from that, I guess it’s just a matter of giving yourself time, being patient and not giving up. All these things are difficult when you’re beating yourself up over everything, but you can’t just flick a switch and suddenly feel confident, so just try doing some small things when you feel able to. I bet you’re better than you think you are.